The choice of filler metal is based on the composition of the base material and the required characteristics of the welded joint. 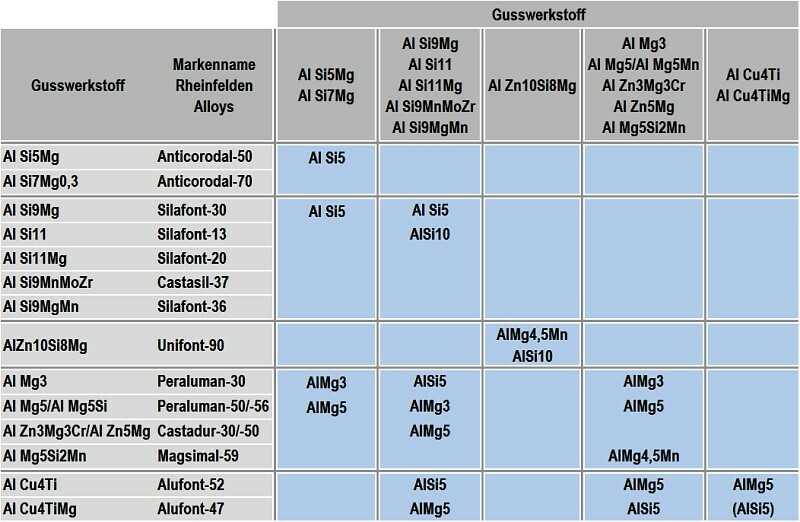 The filler metals used for the gas-shielded welding of base materials are listed in Table 1. Basically, alloy-like filler metals should be used; however, exceptions are possible due to welding-related reasons. Commonly used welding fillers for connecting aluminum castings with wrought alloys (e.g. for connecting castings with sections) can be found in Table 2. As a result of the weld seams shrinking, most of the internal welding stresses occurring in their vicinity are tensile stresses. These stresses can be reduced slightly by avoiding clusters of seams, by workpiece preheating or by subsequent shot peening. A significant reduction can, however, only be achieved by means of stress-relief annealing. In artificially aged alloys, this results in a reduction in strength; if followed by artificial ageing, strength values can only be returned to those of state T5. Appropriate welding and design measures should be taken to avoid straightening welded structures wherever possible. Welding fillers for the fusion welding of aluminum materials are standardized in DIN EN 1732-1 and DIN EN 573. The requirements for welding fillers regarding the resistance to welding cracks are considerably higher than those for the base material. Therefore, an alloy which can be welded without cracking even under unfavorable conditions when used as a base material is not necessarily a suitable welding filler. The hardenable AlMgSi and AlZnMg alloys, which also include the alloys 6061, 7005 and 7020 used in the manufacture of bicycle frames, have a relatively high susceptibility to welding cracks. Therefore, they are usually not welded with welding fillers of the same kind, i.e. they are welded with non-hardenable fillers (Table 3). 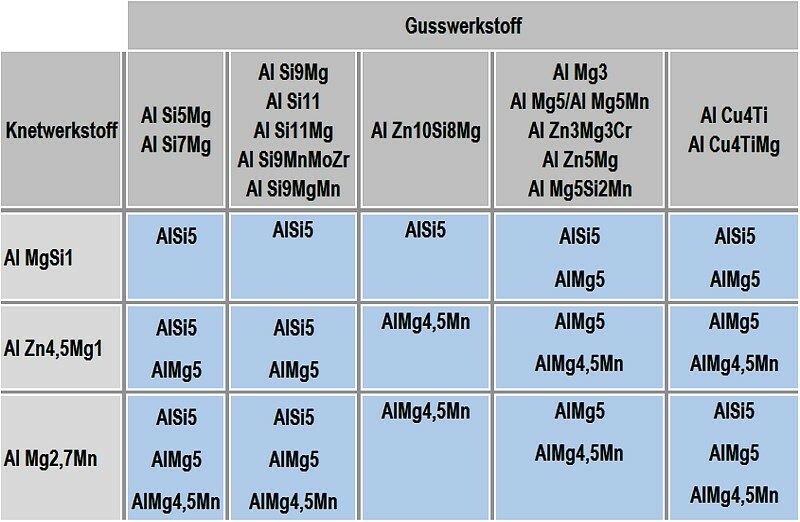 Recommended welding fillers for these alloys are SG-AlMg4,5MnZ having a very low susceptibility to welding cracks thanks to the contained zircon fraction, SG-AlMg4,5Mn exhibiting a slightly higher strength than the one mentioned above and the commonly used SG-AlMg5. 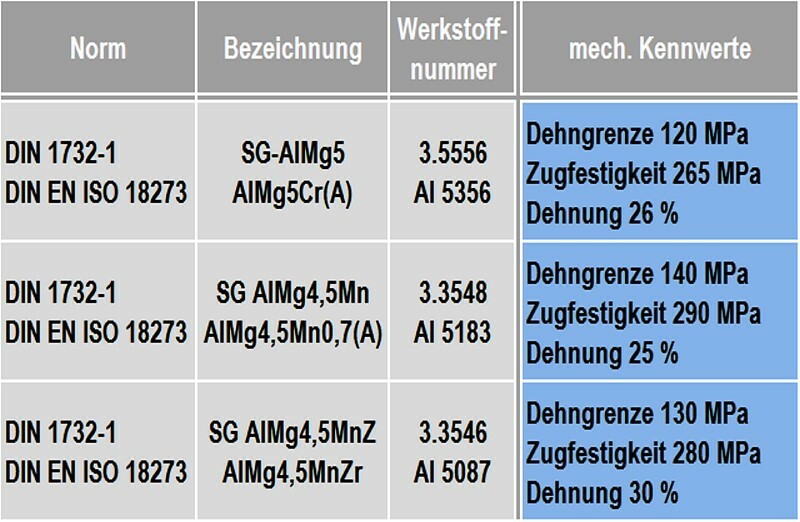 Hüttenaluminium-Gusslegierungen, product catalog, Rheinfelden Alloys GmbH & Co. KG, 2011. Aluminium Taschenbuch, Aluminium-Verlag, Düsseldorf, 2002.